It may be tempting to splurge on a brightly-colored jacket during these cold, dreary winter months, but if you consider your sheepskin coat a long-term investment, it would probably be better to stick with classic colors like black, brown, cream or beige that won’t end up looking dated down the road. For some people, it may make sense to purchase two jackets – one in a light color and one in a dark color – for different occasions. 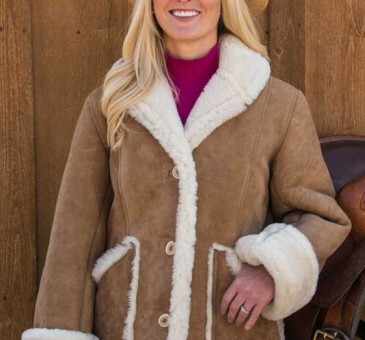 Some of our most popular colors for men’s and women’s shearling coats include Gold Misty, Sahara, Ranch and Ivory, although some people prefer different colors like Pink White or Grey. One of the top reasons to purchase a sheepskin jacket is that the classic style of the garment will transcend current fashion trends and last you several years. That being said, there are a number of different options for style when it comes to choosing a shearling coat, especially for women. Our Ladies Columbine jacket, for instance, boasts a waist-hugging style with feminine lines, a notched collar and attractive wool trim down the front and around the bottom. On the other side of the spectrum, our Ladies Classic sheepskin coat features a shawl collar, oversized pockets and a mid-thigh length that is a little more formal. Similar to our suggestion for color, women may want to consider purchasing two shearling jackets, depending on where they will be most often worn. For example, a shorter coat goes great with laid-back weekend outfits, like jeans and a sweater, while a thigh-length shearling jacket is a better choice for a dressy evening on the town. The appropriate size can be one of the most difficult things to determine when picking out a shearling jacket for yourself or another person. Fortunately, here at The Sheepherder, we use a simple and convenient fitting sheet for each customer to determine the proper size of his or her garment. When filling out your fitting sheet, which is submitted with each purchase, you’ll be asked for information about your height, weight, dress or suit size, shoulder measurement, chest/bust, arm length, waist/belly measurement and hips, so that we can ensure your sheepskin coat will be a perfect fit. All of our shearling garments are custom-made to order, so you can look forward to receiving a sheepskin jacket that was made specifically for you! I am so excited about your products. I will begin saving up so I can surprise my husband with his own sheepskin coat. I can’t wait!!!! Thank you for custom made, highest quality products.